Mr. Agba Jalingo a public commentator and Editor-In-Chief of CrossRiver Watch, an online newspaper and Mr. Jonathan Ugbal, a News Editor, escaped death recently. 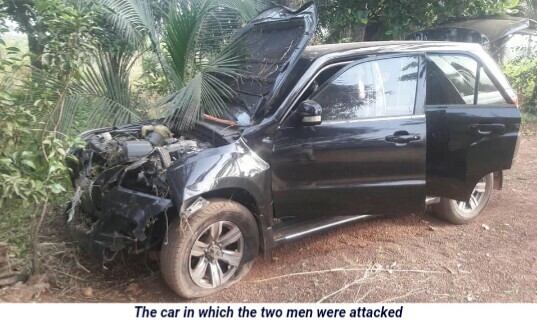 The two men narrowly escaped what was a kidnap or robbery attempt at Amadik community, Arondinzogu in Imo State while traveling to Lagos by road. “I woke up this morning in Calabar to find out that flight ticket to Lagos from Calabar was 68k. I was angry with AirPeace and decided to put one of our cars on the road and hit Lagos. “I called Jonathan Ugbal to come drive. We had a smooth journey until we got to Imo state and things changed. “About 3pm. A Toyota Highlander SUV that was speeding after us appeared by the passenger side and there were three guys inside. “Two flashed AK47 rifles at us and commanded us to stop or they shoot. “Jonathan Ugbal was driving. I encouraged him not to stop. “Don’t stop! I screamed. Reverse and let’s run. “Jonathan reversed successfully and we zoomed. And the worst happened. “Fulani herdsmen were carrying their herd around and the cows strayed into the express. “I told Jonathan to run into them. He did. One cow died and one of our front tire busted. 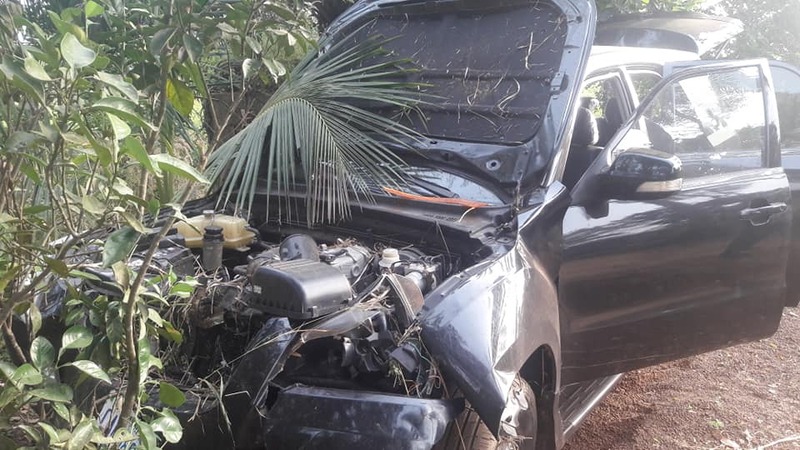 “The impact of the car hitting the cows also forced the bonnet of the car open and blocked the windscreen and we couldn’t see our way again, with one front tire down, the vehicle lost control and began to swerve. 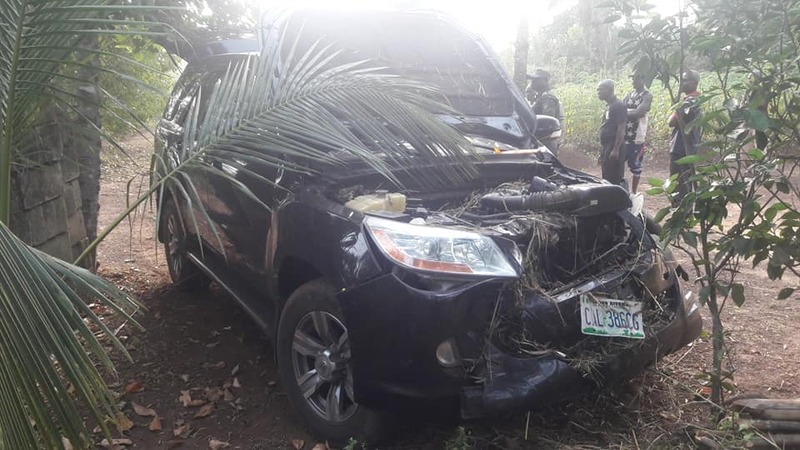 “The bandits kept shooting at our vehicle from behind and the bullets pierced several holes behind the car but we both lowered our heads and kept pushing. “The straying cows became a blessing. The cows stopped the bandits’ vehicle from the pursuit while our car was still swerving until it hit a tree and got damaged. “We both jumped down and ran into a very thick forest. “The bandits came down, ran after us on foot kept firing indiscriminately while we were in the forest. “We spent over an hour in the forest and came out. “The man through whose compound we ran into the bush showed us where his ceiling was riddled with bullets and how the bandits forcibly broke all his room doors asking him to bring us out so they can take us away but couldn’t find us. They also shot two cows dead possibly for blocking their pursuit. “They also ransacked our car and stole our laptops, bag of clothes, Jonathan’s phone and other things. “When we emerged, the Fulani herdsmen now started round two. They insisted we must pay for their dead cows. “I then put a call across to the Cross River state Police Commissioner, CP Hafiz Inuwa, who promptly called the Imo CP. Some cops from federal SARS were sent down. “When they arrived we emerged from hiding and the police rescued us from the herdsmen and took us to Okigwe SARS office. Another team was also sent to go tow our car and the car is now safely parked at the SARS office in Okigwe. “While in SARS office, the commander got a call that the same three man gang driving the same car had kidnapped one Eze and killed another man who was driving a Lexus jeep. They went to pick the body while we were still writing our statements. The police congratulated us for escaping being kidnapped. “The residents of Amadik also told us how they run like they did today, sometimes up to five times a day, because of the way kidnappers way-lay people on the road and cause them to run into their community in panic. “As I type, our bodies are riddled with bruises we sustained from fighting with the elements in the thick forest. We are as dirty as mechanics and our clothes were all stolen so we can’t even change. “We want to thank the commissioners of police in Cross River and Imo States for their prompt response. “But most importantly. I want to specially thank God for continually proving to be God in this our journey. “This is the second time in 3 months we are escaping death. “God won’t leave us alone. God knows we are struggling hard to further the course of mankind and contribute our quota to the development of our State, Nigeria and humanity. “We are confident that the grace of God will continually abide with us without ceasing and our mission will be achieved before we share the grace from this world.